Today a rest day to see some of Port Hedland. This morning I took a tour of the BHP Iron Ore facilities. BHP is the world's second largest iron ore shipper. Last year, 65 million (metric) tons of ore were shipped from Port Hedland. Facilities at Port Hedland do some sorting and crushing, but are primarily for transferring ore from rail to ships. The numbers involved are large. Most of the ore is mined at Mount Whaleback, 426 km south of here. It is crushed at the mine and loaded onto ore cars. Each railroad car holds 115 tons. Railroad cars are assembled into 2.6 km long trains, with 240 ore cars and four locomotives. Approximately nine trains arrive at Port Hedland per day. On June 21st this year, BHP created the world's largest train, some 7.3 km, while testing some new locomotives. At Port Hedland, trains are split and then run through "dumpers" which tip over 2 or 3 cars at a time to dump contents onto conveyor belts. Ore is stockpiled and may be sorted and crushed before loading. There is berthing space for two giant (up to 250,000 ton) ships to load. Port Hedland is the only Australian port to have two such berths. Loading of ships is an almost continuous operation, with other ships waiting offshore. Today seven ships were waiting. About 40% of the ships go to Japan, with Korea and China also important markets. The remainder go to Taiwan, Europe or elsewhere in Australia. Today a ship was loading for Japan and one for China. It takes 14 days to sail to Japan and 35-40 days to sail to Rotterdam via the Cape of Good Hope. The tour gave a good idea of the scale of everything with huge piles of iron ores, giant ships, conveyor belts, dumpers, etc. We also saw a salt ship, headed for Taiwan, being loaded. Across the harbor is a new "Hot Briquetted Iron" plant. This plant forms iron ores into 500g briquettes for use in electric arc steel furnaces. The plant is still new, but expects to ramp to capacity of 2.5 million tons of briquettes. I took a harbor tour in the afternoon. Gave a good chance to see the ships up close, loading iron ores and salt. I also visited the small museum that showed original harbor masters quarters. Otherwise, downtown Port Hedland is small and even boasts the shortest main street in Australia. The old town was built on a small island that was connected to the mainland by a causeway. In the 1960s, the iron ore facilities were first developed. This caused town population to boom from 1200 to 12000. There wasn't enough room on the island for the growth in town size, so most of the people and many of the shops are in a satellite community, South Hedland, some 15 km south of here. Today helicopter activity as a fisherman was lost at sea some 85 km out, and presumed dead. Port Hedland has also been in Australian news due to a detention center for illegal immigrants and recent riots/jailbreaks they've had. Nice strong easterly winds today. Hope they last long enough before I "turn the corner" and head more southwards again. 0 km today, 13095 km cumulative. Easy ride today. Started against the wind coming out of Port Hedland. SE winds with coastal wind warnings from Broome to Onslow today. Moderate traffic between Port Hedland and South Hedland and not much after that. Mostly flat open terrain with a few areas of bushes and trees. After 6 km, walked my bike over the Redbank railroad overpass. Riding again, stopped in South Hedland for brekky. At 42 km, was a turnoff to Newman and the shorter route to Perth. Most traffic however chooses the coastal route. After 52 km, I noticed a cyclist up ahead. No panniers, tent or other long haul gear. Riding a mountain bike with nobby tires, slightly rusted wheel and wobble on the back rim. Stu was riding 190 km to Roebourne today. He hadn't ridden a bicycle since Christmas but made a wager with friends at work. He fixed up his son's bike and started this morning. If he made it to Roebourne, he'd earn ~$600 and give it to charity. I slowed down, Stu sped up, and we cycled together for 20 km or so. Stu worked on natural gas operations at the BHP Hot Briquette plant. We crossed the Yule River after 57 km. Wide banks but only a trickle of water. After 87 km, came across a broken down red station wagon. Broken cooling system (fan belt or perhaps water pump...wasn't quite clear). Driver and his passenger were commiserating with a beer before driving again. I passed them stopped at 90 km mark and stopped again at 102 km. After 100 km, road came around interesting red outcroppings and over a low divide at 112 km. Came to Whim Creek or a late lunch. Whim Creek was nice place with wildlife sanctuary for birds and kangaroos. The hotel was hit by category 5 cyclone in December 1999. A copper mine had operated in this area, but shut down because 2.31% copper was not economically viable to recover. Guys with broken red station wagon arrived after I did, arguing whose half of the car had broken down. A bit of a comic duo. Stu arrived an hour later, sore and deciding to stay here tonight as well. 117 km today, 13212 km cumulative. Late yesterday, Peggy and Justin arrived. They are cycling around Australia, started in Brisbane on Easter Weekend and returning before Christmas. There are at least six of us "all around Australia" cyclists in four groups within a few days of each other southbound through WA...and at least three other 2500+ km cyclists as well. Peak season! (Today in Karratha, heard from the Bike Force bike shop that Bendan and Wendy may be in Karratha as well, and Ben Carey stopped by). Whim Creek is a nice pub. There were a few orphan kangaroos around being nursed. The pub was heavily damaged in Cyclone John, a category five storm that was an almost a direct hit on Whim Creek in December 1999. Occupants survived by sheltering in a shipping container for 22 hours while the roof was blown off and walls knocked over. December is definitely not cycling season here. Last night, flames from bush fires could be seen nearby, and also when I set out this morning. Flat open grasslands without many trees. Fortunately, light winds. Saw several kangaroos hopping along and more road kill than normal. Also more road trains. Easy riding in cool morning air. Crossed Sherlock River at 30 km with nice reflections. Turnoff to Millstream and Karajini National Parks at 57 km and then into Roebourne at 83 km. The tourist info center in Roebourne is in the old Gaol (jail) and is part museum. The rest of Roebourne was small with motel, gas station and store. At the gas station was notice that Monday was holiday for Fenacling, though folks at the gas station didn't know what it celebrated, perhaps the queen? Climbed over a small hill and left Roebourne behind. More traffic here but still quick riding to the Karratha turnoff and then 6 km to town. Karratha has a FeNaClNG festival this weekend which is a celebration of most important products of the Pilbara: iron (Fe), salt (NaCl) and natural gas (NG). Karratha has large natural gas fields and also iron. Otherwise, a larger town with big shopping area and first McDonalds since Darwin. Also Coles and Woolworths to restock for sparse regions coming up. 121 km today, 13333 km cumulative. The Pilbara has beautiful primary colors: golden yellow grasses, reddish rocky hills, blue skies with a slight haze. I'm also seeing a few more wildflowers along the way. A few dusty green trees, but mainly in the creek bottoms. Otherwise, one can see long distances across the land. Fortunately, light variable winds and occasional gradual grades. Left Karratha at first light (Happy FeNaClNG! and happy 101st to Queen Mum!). A little complicated getting out the shopping center, but eventually carried my bike over some medians. Rode 6 km back to main road and then 8 km further to travel stop outside town. The bus from Perth to Darwin was also stopped, so plenty of patrons out. Bought some brekky and a newspaper, though left behind the real estate, automotive and classified sections. On the road again! After 30 km was Miaree Pool, somewhat cloudy looking water...though more than I saw at later river crossings. A crew that had been emptying trash and removing road kill passed me, so didn't see road kill after that. Also, multiple "oversized load" road trains coming the other way. Around 70 km mark, road was a bit rougher with coarse chips, but overall continued to have good roads. Made it to roadhouse in time for a late lunch. Fortescue River itself was a string of pools and wasn't flowing. Still cleaning rooms, so waited in the cafe. This is one of the smaller roadhouses I've seen. 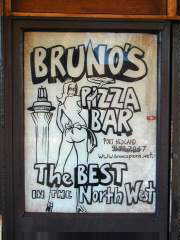 First opened in 1972 and under the same management for the past 25 years. Traffic decreased somewhat when inland route via Newman was opened (100 km shorter for truckies heading north of Port Hedland). 112 km today, 13445 km cumulative. Tap water at Fortescue River Roadhouse had a bit of a taste to it. However, since bottled water was even more expensive than petrol ($2.50/liter vs. $1.10/liter), I filled up with a mixture of tap and bottled water. I've avoided gatorade or other flavors since it seems to encourage things to grow in my water bottles. Rivers in this area are not flowing. When they have water, it is a chain of ponds. This was the case for Peter Creek, Robe River and Cane River today. Bushes increased in density and size as I rode today. Still a few wildflowers, much spinifex grass and occasional rusty rock outcroppings. Light winds, though more often tail wind than head wind. Less traffic than past few days, though at least six caravans from behind gave me a friendly toot. First half hour of riding was still dark, but by the full moon. Peaceful and quiet. Kept the speed down until daylight and then gently gliding along. At 40 km was a turnoff to Pannawonica and also a large scoop from some mining equipment. At 70 km, some caravaners passed and pulled off for morning tea. I'd met them nine days before when leaving Broome. Nice tail winds here for a while. After this, the route paralleled the Parry Range. Arrived in mid afternoon. Water tastes better here. Otherwise, nice to relax after a long ride. 162 km today, 13607 km cumulative. Strong winds from SE and S made a tougher ride today. Started by moonlight again at 5:30 am. Light wind, but it kept getting stronger through the morning. After 10 km, the road widened and signs indicated that the roadway was also an emergency airstrip for Royal Flying Doctors. Watch for planes as well as road trains! Still more scrub, though it got a bit smaller through the day. I counted eleven "grid" crossings, but only ten cows. At each grid crossing, I'd slow down and gently walk across with the bike. Probably fine to ride over, but I wanted to avoid breaking a spoke with a big bump. The first 50 km, the road occasionally turned into the wind. Slow going to grind upwind. Most of the time, it was a cross wind. After 71 km, a rest area and chance for a break. Talked with a caravaner who had blown out two tires, used both spares and was now carefully riding to Carnorvan to get better tires. Some of these caravaners stop for morning tea at rest areas. The Yannarrie River had a few ponds with almost no water. After 85 km, a few ridges to climb. Height was small, but road would occasionally turn into the wind. Finally after 112 km, came turnoff to Coral Bay and Exmouth. As I turned the corner, I picked up a tail wind and could immediately shift up three gears. Yeah! However, a bit worn from before so still kept it slow. The Burkett Road had been sealed three years ago, before that it was gravel. Story I heard is that when the US closed down a base at nearby Learmonth, they turned over buildings with understanding that proceeds from the sale would go towards the road. Nice ride, mostly with the wind for 42 km, where there was a turnoff to Giralia Station and 4 km of gravel road. Giralia Station is a working station with 25,000 sheep that supplements income with tourist accommodation. Each sheep gives an average of 4 kg of wool per year. Water tastes salty, but was able to get rainwater from the station. Delicious evening meal shared with a "Design a Tour" group taking ten days to travel from Perth to Broome. 158 km today, 13765 km cumulative. Today is census day. Even tourist visitors are asked to complete a form, so I had a four page, 46 question form to complete. Wonder if they find any people camping out in the bush. (August 8th West Australian showed a political cartoon where they were knocking on Steve Fossett's balloon as he flew over Australia). Left Giralia Station early and made my way 4 km on gravel to Burkett Road. Wind was blowing from SE again, so nice tail wind to blow me along. It was kangaroo morning and I saw over fifty kangaroos. Some I also heard as a "twang" when they slipped through the fence. From the sounds, they may have marginal night vision (to see me or the fence) since I heard more ugly fence collisions until it got light. A few hopped along rather than crossing the fence, one of them for ~1500 meters or so. He'd hop quicker than the bicycle, but then pause and go again. Also saw two dozen sheep and several emus. Tail wind made for nice travel until the last few kms where there were a few ridges to climb. Paused at the intersection at the Minilya-Exmouth road for some breakfast crackers. Winds still blowing from SE and hence towards Exmouth. I turned southwards to Coral Bay. Next 52 km were a slow slog against the wind. The route sometimes went on a ridge, nice view but worse for wind. Large termite mounds looking like boulders in the fields. I was happy to finally see the Coral Bay turnoff ahead! Turned more away from the wind again and made good time the 12 km to Coral Bay. Mailed next installment of photos and wandered around Coral Bay. Coral Bay is an interesting place. Two huge caravan parks, some small shopping centers, many tour operators and a nice sandy beach. Some of the residents in caravan park look like they've been here for months. Coral reef is accessible from shore and I've rented snorkel gear for tomorrow. First, I have to complete that census form. 105 km today, 13870 km cumulative. I've been told that if I didn't get "trapped in Coral Bay, then you won't get trapped anywhere in Australia". This certainly is a beautiful place, with nice sandy white beaches and an easily accessible coral reef. Tides of 70 cm instead of 6 m at Broome. No pier, but instead a tractor service to launch boats. The Ningaloo Reef stretches from Exmouth southwards to about 60 km south of here. In Coral Bay are hard corals: browns, blues, greens and purples. Also turtles, manta rays and about 500 species of fish. Unlike the Great Barrier Reef off Queensland, one can swim from shore to the reef. Ningaloo Reef is also one of few west coast reefs (another is in Malaysia). A company had a package tour of an hour glass-bottom boat trip, an hour snorkeling from the boat and then use of snorkel gear. I showed up at 8:30am and signed up. Took two long snorkel swims in the morning, the boat trip and snorkel in the afternoon and then another snorkel swim after that. Wonderful! Particularly enjoyed following colorful fish and seeing a variety of corals: staghorn coral, plate coral, cauliflower coral, etc. Some colonies were huge. Stocked up at the store, had seafood basket dinner and otherwise had a relaxing day. From what I understand, prevailing winds will be headwinds until Perth, so expecting some slow rides coming up. No wonder a cyclist might get trapped in Coral Bay. 0 km today, 13870 km cumulative. No wind! Quickly got up and on the road to take advantage of calm winds. Rode 12 km back to the coast road. Interesting how such pretty white beaches are surrounded by reddish desolate looking terrain with just a few bushes. Back on the Minilya-Exmouth Highway and heading southbound. Road surfaces occasionally bumpy, but otherwise good. At 47 km, crossed the Tropic of Capricorn and into the temperate region again. Since entering the tropics at Rockhampton, I'd had no rain. Expect this to change as a sequence of fronts has been hitting Perth. Also been slowly getting cooler. Some roadworks south of the Tropic of Capricorn to widen the road and then back on the main road at 90 km. Here I noticed how bumpy the Minilya-Exmouth road had been, mostly as a contrast to a smoother and wider road. Last 7 km brought me to Minilya Roadhouse. The roadhouse was full, so camped at the rest area on other side of the (dry) Minilya River. In the afternoon, strong coastal breezes. At one point, got into the tent to help anchor it. Later in the afternoon, Peggy cycled up. Her partner, Justin, had developed knee problems riding against headwinds by Nanutarra Roadhouse and thus taken a bus to Carnarvon. They had been one day behind, but caught up again when I took my rest day. Peggy rode from Coral Bay as well today, but started three hours after I did and caught more wind. 97 km today, 13967 km cumulative. A dozen caravans last night, but amazing how everything quiets down early in the evening. By 9 pm usually completely quiet. Every once in a while, a noisy campervan arrives after dark, but fortunately not last night. Back into early morning cycling to beat the wind. Made it 40 km in complete calm before head winds started. Lots of scrub bushes along the way, so not many views. A few low hills between 40 km and 60 km marks. Saw several foxes, wild goats, sheep and many birds. Yesterday some caravaners asked if I'd heard any "got-ta-get-drunk birds". Nope. However, today I then noticed many bird calls with four notes in decreasing tones. A few stations along the way including Boologooro Station, above left, at 80 km. Last 100 km were against the wind, but fortunately not too strong today. At 120 km, signs indicated to get rid of contaminated produce before entering the Carnarvon Horticulture District. I ate my orange just in case. The Carnarvon district is irrigated from underground bores. 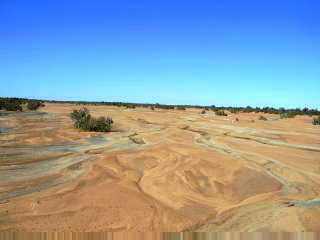 The Gascoyne River rarely flows above ground, but replenishes large underground reserves of water. Saw lots of banana trees and also vegetables. At 125 km, crossed a long single-lane bridge over the dry Gascoyne River. Road turned westwards into afternoon sea breezes. Slowly made my way to downtown Carnarvon. Definitely ready for a rest. Walked around downtown a bit. Carnarvon has ~9000 residents which makes it big enough town for a movie theater and senior center. However, still small enough to have "visiting doctor" posters and also lacking a bike shop. Carnarvon bananas are $1.69/kg at Woolworths. Outside town are huge satellite disks described as "the former OTC Space Communication Station." Not certain what OTC stands for. 139 km today, 14106 km cumulative.